Google Sheets are great but a handy add-on may bring this tool to the next level or create a nifty connection to another tool. This page collects the best add-ons for digital marketers. The power of Google Analytics API gives you access to all of your Google Analytics data and allows you to schedule automated reporting. Once data is in Google Sheets, you can create your own custom dashboard, connect the data with other sources and create custom calculations. If you work with high traffic websites, you may be getting sampled data which is a problem even though Google does its best to provide as accurate data as possible. This add-on promises to avoid sample data by sending multiple requests to Google Analytics. After a few tests, this tool really provides more accurate numbers for sampled data than the official Google Analytics add-on (above) but still doesn’t match with the numbers in Google Analytics. 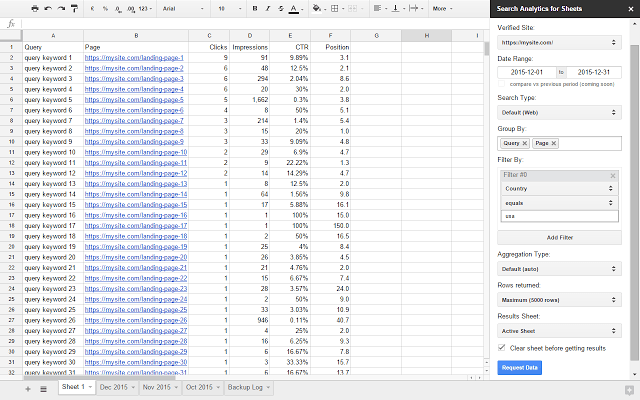 This great add-on connects Google Search Console with Google Sheets. It allows you to download Search Analytics report data via Search Console API or schedule automatic monthly backups. Save tweets which include a specific hashtag, keyword or just save all tweets from a user in a Google Sheet. It may be used for tracking your brand mentions. The tool downloads all information about the author of a tweet (profile bio, location, followers, etc.). The only limitation of this add-on is the fact that it won’t collect tweets older than 7 days. Gathering numbers from multiple sources and displaying them is time-consuming and Supermetrics build this add-on to help you automate your reporting and make your life easier. They provide integration for Google Analytics, AdWords, Facebook Ads, Bing Ads, Twiter Ads, Instagram, MailChimp and many more. Use the Merchant Center add-on for Google Sheets to quickly submit your product data to Google Merchant Center. When a feed is created, you can choose to use the provided Merchant Center template (recommended) or use your own Google spreadsheet to share your product data. Your spreadsheet needs to be registered as a feed in Merchant Center in order for this add-on to work (more info). Adds eleven new functions through which you can harvest information from Wikipedia and Wikidata directly from Google Sheets. It allows you even to download the number of pageviews for a given Wikipedia article. In order to build charts for data in BigQuery, you need to save the results to a CSV file. 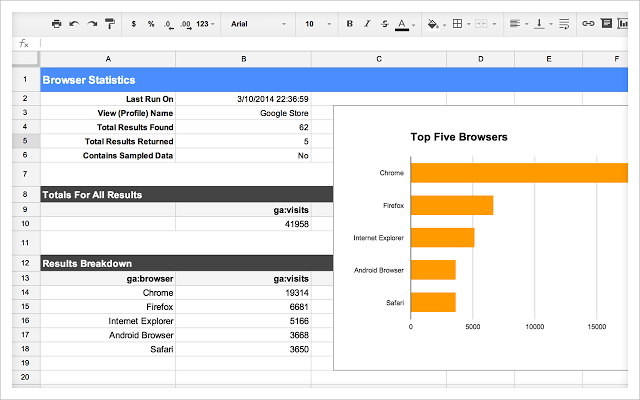 This add-on allows you to import data directly to Google Sheets where you can perform further analyses. You can provide dynamic parameters in the query that can be used by ones who are not familiar with SQL. Mapping Sheets add-on helps mark out your list of locations on a Google Map. How to leverage this add-on for marketing purposes? Visualize your client addresses on a map to see where the majority lives and focus your marketing effort to that area (events, meetups, etc.). Searching and filtering functions are included, therefore, you’re limited only by your creativity and the quality of the input data. Maps are saved in .json files in a xsMapping folder in your Google Drive. That allows sharing all maps with your colleagues. For those who have a Majestic subscription, this simple add-on import data about your link profile directly into Google Sheets without having to log on to your Majestic account.